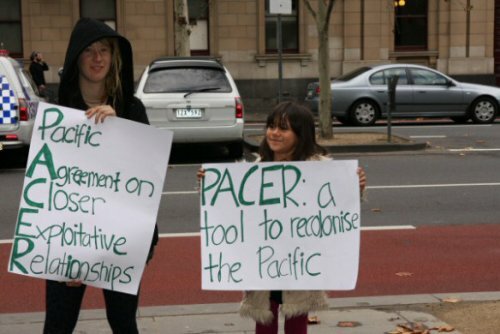 Some eight years of negotiations on the legal texts have gone into deciding what the Pacific free trade agreement would comprise. The last day of such discussions was on Friday in Christchurch, New Zealand. The whole idea, with the best of intentions of all the island states and the two big wealthy countries, Australia and New Zealand, has been to create jobs, raise standards of living and encourage sustainable economic development in the island countries. Trade ministers from all the island members of the Pacific Islands Forum have been discussing final texts and where their talks have reached politically. There is no agreement as yet. And there is an interesting point of view from Vanuatu. A petition calling for suspension of any decision until there was more worker representation arrived at last week’s New Zealand conference of ministers and officials. Lack of worker representation was expressed. And prior to that Papua New Guinea declared its withdrawal from the agreement. Fiji was still expressing reservations leading up to the final conference. Vanuatu wants all of the government MPs to view the whole text before it decides whether to join or not. A Council of Ministers’ decision a fortnight ago said exactly that when chief negotiator Sumbue Antas released drafts of some of the texts to government MPs at that time. This is the position as described by Lands Minister Regenvanu on Tanna last week. In the past, government MPs have never seen the texts of these trade details before they are signed by trade officials, and then the minister responsible. They are then just obliged to vote on them in Parliament, without actually seeing them in full first of all. A similar situation occurred when there was an outcry and the “Say No to the WTO” posters of nearly 10 years ago. This was when the likelihood of Vanuatu joining the World Trade Organisation had reached the eleventh hour. Ill-informed legislation can lead to problems within a country and political movements. MP Ralph Regenvanu voted against the WTO accession and that led to his being removed from government at that time. The Council of Ministers is now getting big issues like this one, PACER-Plus, better into perspective. Elected MPs will actually have the advantage of seeing what they are voting on first of all: the full text, and in writing. They will know it all before they vote on it. And those who haven’t paid much attention to what PACER-Plus really is should get to know a lot more about it now. Thanks for good reporting. One issue that seems to be glossed over is the lack of any independent impact assessments that would actually be able to clearly spell out the costs and benefits of the deal, enable countries to strengthen the text and allow the people to interpret the elements that will affect their lives. The push to conclude, sign and implement before such assessments have been done in each country is significant. Who is pushing and why? The baseline assessment in 2007 raised many issues that have not been addressed since, for instance, to Cite Nathan Associates 2007: "It is essential that strategies for environmental management and resource protection are mutually beneficial for all FICs, yet nationally owned. These strategies should be put in place before Pacific markets expand and should aim to strike a balance between environmental sustainability and economic growth." No assessment has been carried out either regionally or nationally on this topic - given the certainty of environmental impacts and therefore the need for increased environmental regulation any pretence at an "aid package" would have to include ongoing and increased funding to regulatory agencies. Likewise, as in many countries, the bulk of environmental control falls to indigenous communities who communally own the land. While these are sovereign rights we need to see safeguards in place or spelt out for each country and "consultation on mechanisms to identify and share best practices is appropriate because of the complexity of the issue." Being hasty and failing to carry out due diligence will fail the people of the Pacific and not serve the commonly agreed purpose of the deal. Lets hope all the independent countries follow the lead of Vanuatu, Fiji, and PNG and think it through carefully.